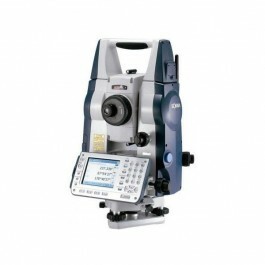 the SET2x total station has an angle accuracy of 2″ / 0.6mg and includes absolute encoders enhanced with Sokkia innovative system Independent Angle Calibration (IACS) to provide extremely reliable angle measurement with unprecedented stability. Expandable Windows CE installed SET X has an easy-to-see color LCD touch screen display and its operability puts it in a class of its own. On-board SDR program is Windows CE-based data collection software that increases functionality by providing powerful surveying programs with an easy-to-follow workflow, customizable settings and a graphic interface. SET X offers the highest in environmental protection for Windows CE total stations*. SET X has an IP65 rating, meaning it is able to withstand the harshest conditions in the most demanding jobsites. SET X maintains its IP65 rating even with the external battery connected. RED-tech EX EDM is acclaimed for pinpoint accuracy using an ultra-narrow red laser beam and for the flexibility to measure from the industry’s shortest distance of 30cm (1ft.) up to 500m (1,640ft.). RED-tech EX performs accurate reflectorless measurement of building corners, telephone/electrical wires, manholes, and even through fences. RED-tech EX uses only one laser beam for distance measurement and pointing, meaning it exactly measures the red laser point. The laser beam diameter and output level are automatically optimized according to the target type providing stability that you have never experienced before. Measure distances up to 6,000m (19,680ft.) using a single AP prism and 500m (1,640ft.) using reflective sheet targets. SET X features SOKKIA’s original absolute encoders that provide long-term reliability in any work-site conditions. SET1X and SET2X feature groundbreaking IACS (Independent Angle Calibration System) technology for extremely reliable angle measurement. SET X features an ergonomically placed trigger key that greatly facilitates taking measurement while looking through the telescope and even while turning the fine motion screws. Measurement can be taken at any time with just the push of a button. Enjoy a wireless connection with your data collector or tablet PC for expanded data collection possibilities and seamless data handling. Class 1 Bluetooth wireless technology provides license-free prism-side communication of up to 200m. SET X has 1MB of internal memory, CF card slot and USB ports. A 1GB SD card can also be used with an adapter.